Junji Saito (?-1988) created Yoshitsune Waza jujitsu, the formal style we study at Ju-Jitsu Dojo of Columbia. Traditional Martial Arts, by Michael DePasquale Sr. I first met Junji (Jun) Saito about January, 1960. He was quite small in stature, measuring about five feet no inches in height. He was slender, too, which added to the impression one got when meeting him for the first time. He had a full head of white hair and wore wire-framed glasses. He spoke softly and had that rare ability to make people listen attentively when he passed on his gems of martial arts techniques. Sensei Saito was a reporter for a Japanese newspaper and was assigned to London England some years prior to Lloyd George becoming Prime Minister of England. During this period he joined a Japanese Kodokan chartered Judo club which numbered several women in its ranks. Bearing in mind that Sensei was very small and very light in weight, and that he was required to randori with other members of the dojo, it should come as no surprise that Sensei could never win any matches. I can still hear him say "I never win any randori because my female opponents were too big. They always beat me with o soto gari. English girls have strong legs." Needless to say, he was dissatisfied with judo; he was incapable of competing as a judoka, and so could never win any matches. Imagine his frustration with Judo, which is itself a very hard and driving sport. 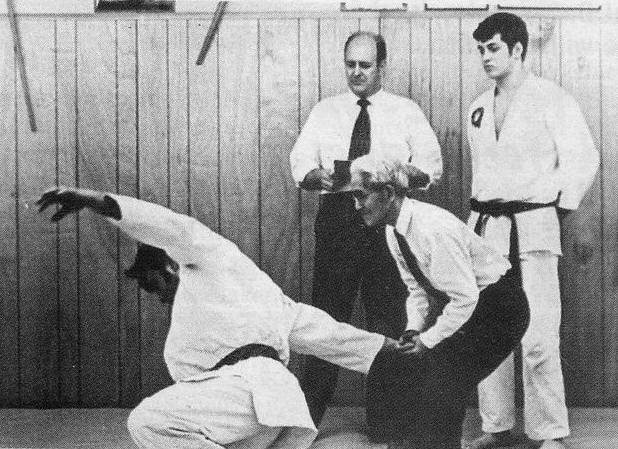 Upon returning to Japan, Sensei became a student of an 86-year-old Jigen Ryu instructor. Sensei explained that there only five kata in that system. He explained that the system was easy to learn due to the fact that once the kata were learned, the student would develop combat movement on his own, using the kata as a teaching/training system. Sensei told me that his family was a samurai family, and that he was authorized to wear the topknot, which was the sign of a legitimate samurai. There followed many years of learning additional ju-jutsu systems, among which were Kito Ryu, Jigen Ryu, Sosuishi Ryu, Sekiguchi Ryu, and Hakko Ryu. 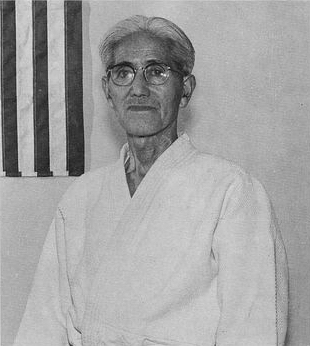 Sensei Saito took all of the above-listed systems and combined his favorite techniques so as to develop them into one system. Sensei Saito decided to call his newly-developed system "Yoshitsune Ju-Jitsu". He called it Yoshitsune Waza because he had only one dojo he taught at. That dojo was Yoshitsune Dojo. His system was thereafter known as "Yoshitsune Waza" because it was taught at Yoshitsune Dojo. He was the last remaining member of his samurai family. He stated that inasmuch as he had no remaining family member to inherit his ju-jutsu techniques, he was passing on the system and techniques to the undersigned. Training in the early days was quite different. We had no weightlifting equipment that could compare with today's shiny chrome bars, treadmills, stair climbers, electronic rowing machines etc. Our biggie was a shiny log about 40 inches long, which we hung from the ceiling and was used to "slap". This brought heavy blood flow in to the hands and resulted in thick, "meaty" hands which were strong and very hard. Many students used to carry pocket makiwara, which were made of carpet wrapped around a piece of plywood about 2 1/2 inches by 5'. One could always tell the new students by their makiwara. Tameshi wari, or breaking techniques, were practiced very often and for many hours at a time. The idea in the old days was "block his attack, step in strong and punch his lights out". To do this, the students had to be fast and strong. All of his waking day was passed in hitting the makiwara, and kumite with strong attacks and fast punches. Today's karateka are stronger, younger, faster, and bigger. In days gone by, practitioners were slower, weaker, and smaller. They were also meaner and more prone to take a punch in order to make a point. Like the proverbial street fighter, he was not afraid to get hurt, and more important, he was not afraid to hurt you. We had no such thing as "sportsmen". We only had people who were intent on winning! To give you an objective example: Today we have video cassette recorders, fancy cameras, TVs, computers etc. Way back then, we had two-inch steel pipe cut into five-foot lengths and filled with concrete. This was our "weightlifting equipment". We also used 4 x 4 posts cut in five-foot lengths, one end of the post was planed down a section of about eight inches in diameter. This item was used to build up forearms and shoulders. It was slowly turned in large circles over the head, in front of the body, and also in big figure eights; while turning in a circle, it was also popular to take 3/4-inch pipe in six-inch lengths filled with lead. Beside being used to exercise the arms as a punching aid, it was sometimes taped to the ankle and used to improve power in kicking exercises. The big thing was recording the training sessions with Kodak movie cameras. (The old timers held reels of film, which sometimes lasted a good five minutes.) All in all, we were poor in equipment, but rich in training and protocol. Respect was the hallmark. If, for example, two students became involved in an argument or were on the verge of fighting, the black belts would tear into both students and reprimand them in front of the entire class and literally "force" them to shake hands. How do you fight someone you had just shaken hands with? All in all, we must remember that these instructors were the first in the USA to introduce the Japanese and Okinawa systems of martial arts. They brought with them the ideas and methods of the old masters. Their training was directly made to the students. they were samurai and taught by the original samurai methods. Hence we had Oyama, Funakoshi, Nagle, Parker, Jay, Urban, and a few others. The taiso and kumite were performed with power and strength. Very few excuses were accepted. Outside of dropping to the deck in a coma, the student reporting for class did so expecting to return to his base tired, sore, and filled with valuable new knowledge, which only a devastating workout could produce. Thus, we have the ultimate. The oriental masters are no longer amongst us. The grandmaster instructors such as Junji Saito are no longer with us. Hence, it follows that the "Top Knots'" ways have departed this world. I put it this way: if it were possible that Michelangelo had taught some fledgling American soldier how to paint or sculpt, "How valuable do his students become? How much value do you place on the samurai's last students/" (Right, Pete? Right, Don?) Yes, the old timers are gone. But so are the free lunch, the horse-drawn trolley, the police helmet, and the tradition of tipping your had to a lady. Many things have changed. Where once it was fashion and self defense, a gentleman carried a cane (walking stick) and used it as a weapon. Now, we do not meet problems head on. No, we hire a lawyer. Good night, and God be with you. This article is from Karate International, possibly June 1996.